It takes a rare kind of film to be devoid of both action and dialogue for its first twenty minutes and still keep the excitement flowing. 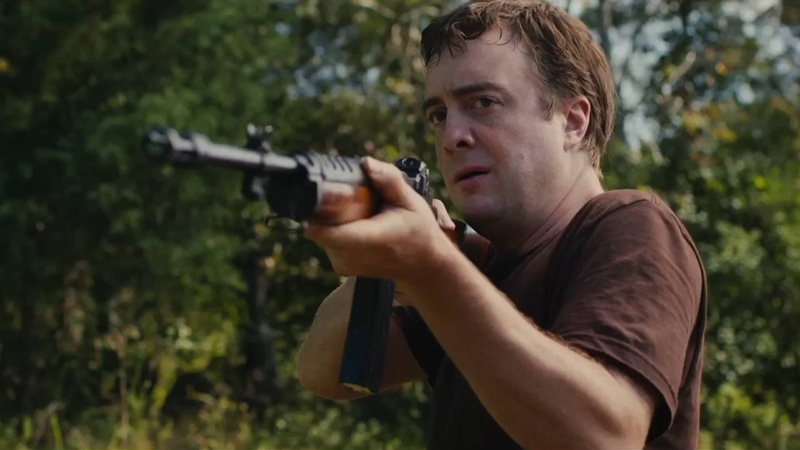 Blue Ruin tells a revenge story in a topsy-turvy sort of way. One murder happens very early in the film that would normally happen much later, while a major truth is withheld until the film is nearly over. It is an unexpected way to tell a predictable sort of story. This is one of those films where any possible detail I give is a potential spoiler, and some are bigger and more obvious than others. I don’t want to spoil anything though, not because spoilers freak me out, but because this film is a lot more fun if you go into it with a degree of naivety. The vaguest way I can outline Blue Ruin is that it is about a quite man named Dwight (Macon Blair) who is on a violent mission in the name of honor. He starts the film with a beard that makes him look like a hipster Charles Manson (or just…Charles Manson?) and ends it in a clean shaven look that makes him look like Joe Lo Truglio. This past year, a sub-genre that I will just call The Southern picked up steam. Its peak was with True Detective and its nadir with Joe. Blue Ruin falls in between them, but much closer to the top. This Mid-Atlantic thriller is a mix of old fashioned outlaws, rednecks, and suburbanites who just want to raise their damn families. Dwight is one of the most eccentric characters to come out of recent cinema. Blue Ruin has been compared to the Coen Brothers, which makes sense. It has the energetic ultra-violence that made Blood Simple their breakout film. Dwight is like a classic Coen Brothers character; enigmatic to the point of almost seeming invincible. Yet, Dwight is far from that, as he is terrible at hatching schemes and he is an even worse shot. While he has a habit for bandaging himself up (including one cringe-inducing scene where he pulls an arrow out of his leg), he is anti-Chigurh. Do you ever see a film and feel like you have watched it before, but this time it is just a little different? That is how I feel about Blue Ruin. Director Jeremy Saulnier finds ways to get you to chuckle when you’re not supposed to. You will be yelling at people hiding behind objects, and finding that the emotional stakes secretly work incredibly well. When you think the soundtrack would be ambient, it is instead filled with songs both young and old from a variety of genres. Blue Ruin is a small, quiet gem that was overlooked (I am guilty of this, too, as I just watched it for the first time earlier this week), but it is now ripe for rediscovery. Short in length, Blue Ruin proves that the only thing more impressive than telling a good story, is telling one that accomplishes everything it sets out to accomplish in just 90 minutes. Blue Ruin is now streaming on Netflix. This entry was posted in Uncategorized and tagged Blue Ruin, Movie Review on January 8, 2015 by ian0592.